Winter weather isn’t just a threat to homes in Middle Tennessee and the surrounding areas—it can also do a number on outdoor structures, especially horse barns. At Hilltop Structures, we know that winter weather doesn’t have to be exceptionally harsh to cause damage to your structure. In fact, just a few consecutive nights of freezing weather complete with rain, snow, and ice can cause thousands of dollars in damage to poorly constructed and poorly insulated horse barns—not to mention the detrimental effects it can have on the health and well-being of the horses inside. At Hilltop Structures, we believe that people who buy horse barns should have peace of mind about their investments and the health and safety of their beloved animals. Horse barns are both investments and safe havens, and you should never have to worry about whether your investment will last or whether your horses will be safe inside their shelter. The roofs on many outdoor structures aren’t built to handle heavy weights. That means heavy snowfall and ice accumulation can put some structures at risk of a roof collapse, resulting in catastrophic structural damage and putting the safety of the horses inside in jeopardy. 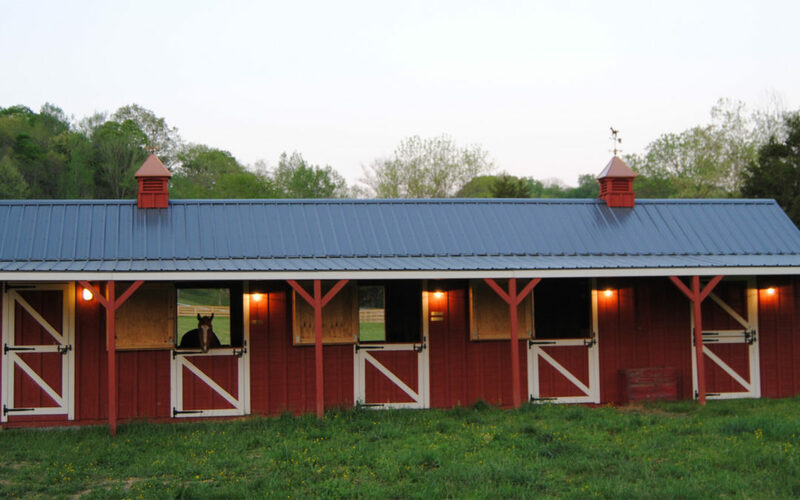 Our horse barns are built with 2x4 rafters, purlins 24” OC and an energy star rated metal roof. We also use matching drip edge, with mini corners on all gables to keep all rain water channeled off the roof and away from any bare wood. Our barns are designed to hold up under the harshest conditions without sagging or leaking. Freezing temperatures are common in Middle Tennessee from late fall to early spring. And while homeowners have the benefit of insulated homes and HVAC units to stay warm during cold nights, horses don’t always have the same luxury. At Hilltop Structures, we know how important it is for horse owners to make sure their animals stay happy and healthy. That’s why we offer totally enclosed stalls with dutch doors (you can leave the top door open in warmer weather) and our barns also have a 30”x30” wooden hinged window on the back wall to open for cross ventilation if needed. All of our barns also come with bubble wrap insulation vapor barrier under the 40 yr metal roof. This insulation barrier help eliminate any condensation or water dripping down on your horses and helps protect horses from the harsh outdoor elements. When you buy a horse barn, making sure your new outdoor structure survives one winter isn’t enough. You need to trust that it won’t just survive, but thrive, for many years to come. 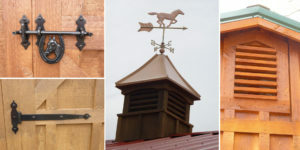 By using a high-quality siding in our manufacturing process, along with two coats of Sherman Williams Super deck semi solid stain (a premium duck back technology product)our horse barns are designed to not only perform at high levels during harsh winter weather, they’ll also continue to look great for many years. 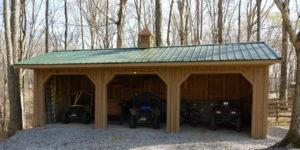 These barns also work great for garages, carports etc. Making sure the stalls are safe and closed off to the elements. The delivery Crew from HillTop Structures will bring your horse barn on a flatbed trailer, once they assess the situation, they will either back the trailer onto your level site or unload the barn in the driveway and then use the “Mule”. (See our website for a demonstration of this little miracle machine in action) Once the barn is safely in position the Crew will remove the braces, cut timbers to put under the partition walls between stalls. Once they are finished the stalls will be totally safe with no place for your horse to get his legs under a stall partition wall or for small animals to get in to rob your horse of his feed. We have a 12×44- three stall run in/barn with an eight foot tack room. Charity worked with us to make a custom design that functions both as a run in and barn. We handmade stall guards to span the run ins for when we want to keep the horses up. The front of the barn has Dutch doors/ while the back side is run ins. They did an excellent job building, staining, and delivering our barn all the way to Spring Hill. Dave and his team were very patient with our tedious selections (stain, roofing, material) and once it was built they waited weeks for just the right weather condition to deliver the structure. They have superior workmanship and excellent customer service and communication!!!! The product and the service far exceeded our expectations!!!! Honest people doing quality work. We will enjoy this barn for many years to come. Thanks Hilltop! Temperatures are already dropping in Middle Tennessee and its surrounding areas, but there’s still plenty of time to get a horse barn delivered to your property before winter arrives. 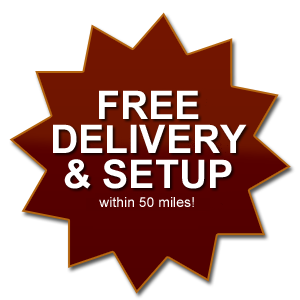 Contact Hilltop Structures today by dialing (615) 789-0062 and set up a delivery date for your new horse barn today.